Many of our patients have signed up to Systmonline services to order repeat prescriptions, book or cancel appointments or ask us simple questions online – all at times convenient to them. You can sign up for free and secure online services on our website, or by asking for more information at reception. Systmonline is now available as an easy to use app for Apple and Android smartphone and tablet devices - giving you the convenience to manage your health care, anywhere and at any time. The app can be downloaded free of charge from iTunes or Play Store. The app allows patients to manage their healthcare all from one place, with much of the same functionality as the online service. You can log into the app with a username and password provided by the practice - if you already have a current Systmonline username and password, these can be used to log into the app after download to your smartphone or tablet. Patients can view their own personal information, order repeat prescriptions, book and cancel appointments, update calendars, create reminders; and send and receive messages. Other features are in development; including access to your records and test results. 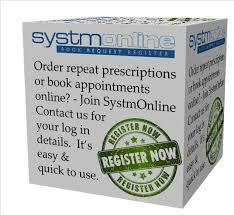 Don’t forget - to register for Systmonline services you will need a username and password provided by the surgery. Please ask at reception for more information.